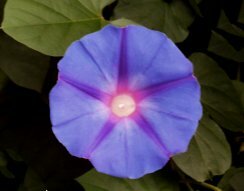 The morning glory has the botanical name of Ipomoea purpurea. It is is an annual vine which grows in gardens the world over. Morning Glory seeds can be purchased from most garden centres. A number of colours and trumpet shapes are available, so pick whichever you like the look of. The great thing is that Morning Glories produce 'true' so the picture on the packet gives a very realistic idea of what to expect. Seeds are sold in most garden centres and cost around £2.20 ($3.30) for 40-50 seeds (2013 prices). However, if you allow a crop to run to seed, you will get many thousands of seeds for free for next year's planting. Large funnel-shaped white blue or pink flowers last only a day, but the morning glory puts out lots of flowers during a season. This also allows a gardener to harvest lots of morning glory seeds. Here are some easy instructions for growing seeds. Sow in spring. The seed husk is thick and fibrous so soaking seeds for 24 hours or knicking them with a knife will greatly aid germination. Sow one or two seeds in a 3 inch pot with all-purpose potting compost mixed with a couple of handfuls of perlite for extra drainage. Cover with another inch of compost and water well. Keep watered and within a week strong shoots will appear. Once the shoots are more than an inch high, transplant out into the garden. You should beware that slugs do like the young shoots so take whatever precautions you can to avoid losing your crop of morning glory plants. The Morning glory is a strong climber so it will need something to climb up. A wall, fence or garden poles will suffice. You should get a forest of green shoots growing up to beyond six foot. Each morning you will be greeted by a profusion of stunning flowers which will have died away by the evening. Leave the dead flowers on the vine and within a few weeks they will develop into thick seeds, just like those you planted, only now, you will have thousands, so next years crop can be bigger, more spectacular and yet cost you nothing. Simply wait until the flowers fall and soon seeds will start to grow. Wait until these are large and ripe and dry before harvesting your morning glory seeds.. Please be careful that you store the seeds safely. In particular it is essential you make sure that children do not eat the seeds. Ipomoea purpurea bought from seed merchants are said to be coated with an emetic (vomit inducing) spray. The reason for this is that the seeds have hallucinogenic properties when ingested (particularly the very popular 'heavenly blue' variety) and although not likely to cause lasting damage you had best keep them safely locked away. We could find no exact toxicity data and would therefore recommend that profession help is sought if a child swallows any quantity of Morning Glory seeds. Annecdotal evidence suiuggests that If an adult swallows a few seeds they will likely feel no effect whatsoever since the hallucinogenic compounds are inside the husk. If an adult has been silly enough to chew more than about 30 seeds they may well seem confused an hour or so later. The sensible thing to do is to remain calm and allow them to enjoy the experience which may last up to 12 hours. The only real danger is from stressing them out to the point where they run away and perhaps forget about traffic on the roads. Basically be nice to them and look after them and keep the severe telling off till the following day when they should be back to normal.